Rebecca Lam is an aspiring show/ride engineer. Originally from Atlanta, she has spent the past few years pursuing her Mechanical Engineering degree at Rice University in Houston, TX. With a love for both the creative and engineering spheres and the ability to speak English, Mandarin and Spanish, we think Rebecca has a great future in the attractions industry. This is a selective report on the 2014 IAAPA Attractions Expo in Orlando, with an emphasis on new trends and developments. 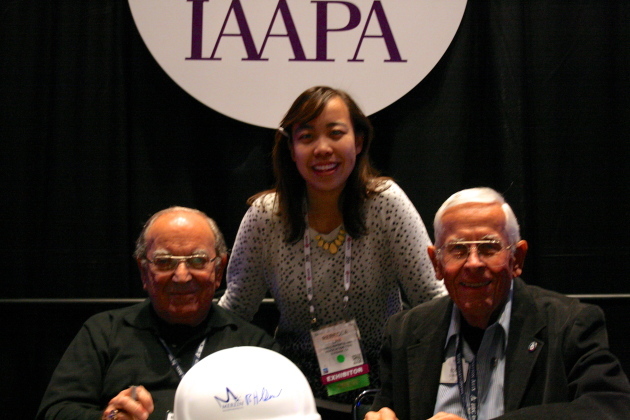 Image at top: Rebecca Lam with Disney Legends Marty Sklar and Bob Gurr. 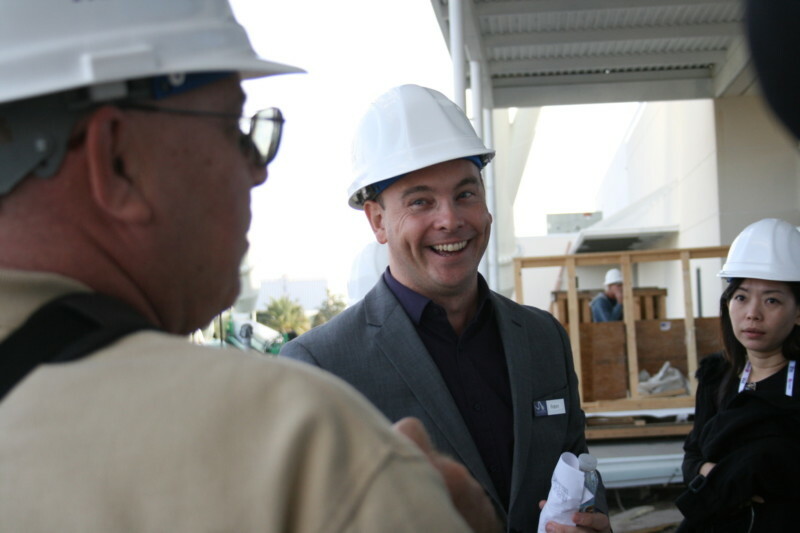 See more photos taken by Rebecca Lam at IAAPA 2014 here. 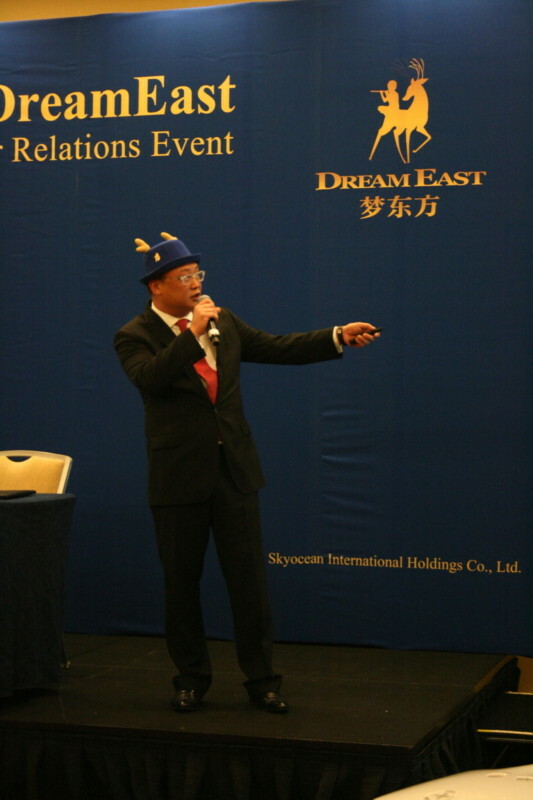 At its brand launch and supplier relations event, Dream East introduced itself as the cultural entertainment division of SkyOcean International Holdings, Ltd. With each guest at the event sporting a blue DreamEast antler bowler, the company introduced its new project and first theme park rollout, DreamEast – Legend World. The locations that DreamEast hopes to focus on are Beijing, Shanghai, and Shenzhen. Each would be an all-inclusive destination with retail, hospitality and entertainment geared to tourists and locals alike. A video detailing the vision for DreamEast – Legend World toured guests through the vision of a typical day at a Legend World park. After entering a Main St. of Mandarin with a never-ending festival celebrating China’s identity, one can enter Innovationland where grand hot air balloon tours are made possible using inverted projection domes, while experiences in Wonderland such as the Silk Road Experience takes guests through the historical trade route that led to the collision of east and west. Other attractions include the Diving Dragon roller coaster, Monkey King Heaven Havoc ride, Prince Nezha’s Undersea Adventure, and other ventures into tours, shows, and rides that encapsulate China’s cultural essence. Finally, the day concludes with the China Dream Spectacular where the Demon Bull comes to destroy the land and is thwarted and finally defeated by the Monkey King. The first group of DreamEast vendors given the chance to seal their agreements onstage with signings and handshakes during the event includes Carlo Görtjes of Lagotronics, Liáng Xīn of Playfun, Yang Yīngjùn of Wincomn, Xiāo Dí of Betop Multimedia, and James Yoon from Simuline, with the signing conducted by DreamEast representative, He Yijie. Another new appearance at IAAPA was that of CXC Simulations, a racing simulation company founded in 2006 by a team of former professional racecar drivers. Worldwide, CXC attests to already having 200 simulators installed, training racecar drivers from carts to Formula Mazda. CXC roared into the themed entertainment scene as first-time IAAPA exhibitors with an average of 180 drivers per day testing out their simulators, and two reported sales to Andretti Parks. “We chose the CXC Racing Simulators for our next location because it will give our valued guests a very real and challenging racing experience while allowing several drivers to compete against each other. It offers professional-level simulation to our customers at an affordable price,” states Eddie Hamann, a Managing Member of Andretti Indoor Karting & Games. According to Chris Considine, CXC Simulation CEO, accurate physical feedback is given through features from tightening seatbelt straps that imitate real-life braking to actuators providing feedback from even small road bumps. “We bring something unique where high end simulation meets that love of competition,” he says. Drivers have the ability to race other drivers, displaying a leader board to onlookers. IAAPA attendees enjoyed an added bonus of real-time race commentary. At the unveiling, River Racing World Championship driver, Ricky Maldonado, and two Cruden exhibitors demonstrated the first public run of the Powerboat 5CTR, emerging from underneath the powerboat’s covering. 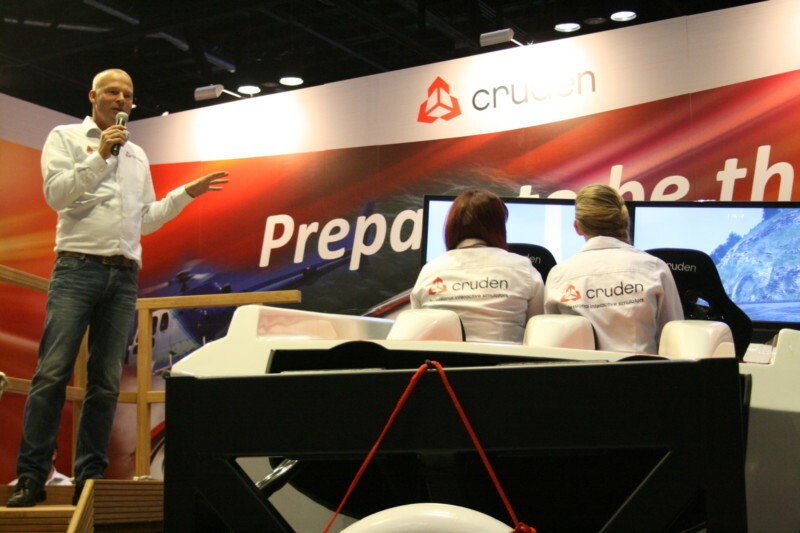 The next steps that Cruden will be taking with the powerboat simulator is developing a waterproof version for waterparks along with additional simulation features such as jumping ramps and environmental aspects such as waterfalls. A hard-hat tour given by Merlin Entertainments introduced the International Drive attractions now under construction. The centerpiece is the Orlando Eye, a towering observation wheel that will span over 400 feet in height, comparable to the London Eye, its sister wheel in the UK. However, “this wheel has its own identity, different than the London Eye,” explains Robin Goodchild, a Merlin Entertainments manager, as he gestures to the towering structures already set in place. The theme of the I-Drive 360 Orlando package is flexibility, seen in both space use and attraction variety, as it seeks to bring the whole family together. The complex will contain free parking, shopping, and dining that line the walk to the Orlando Eye, along with a half hour fountain show. Combo tickets and transportation to Legoland Florida will also be available. However, the Orlando Eye experience is only one step in the renaissance of International Drive, which is aiming to be an attraction giant in its own right and motivate tourists to add a sixth day to a typical five-day vacation. If successful, this move is projected to have a $1 billion impact on Orlando’s economy. The Orlando Eye will serve as an opportunity to have a breathtaking 360° unobstructed view of Orlando in one of 30 capsules set on the outside of the structure, unlike a Ferris wheel, where capsules are placed within the wheel’s perimeter. Each capsule can hold 15 people with on-board audio and air-conditioning, RGB LEDs to minimize glare, and tablets equipped with educational topics such as engineering and tourism, art, history, and marine conservation. The wheel itself runs on an electric rather than a hydraulic drive with 14 motors, completing full rotations in 19 minutes, moving even during loading and unloading, and even has its own generator in case of power outage. Moisture from the wheel’s exterior will be collected daily and used for cleaning the outside of the capsules, creating an environmentally friendly process that will conserve gallons of unused water. The observation wheel experience will include photo-ops courtesy of Magic Memories, incorporating guests’ photos into a book that includes information on the wheel and sights around it. Preceding their excursion on the Orlando Eye, guests will enjoy a four-minute 4D introductory show. This I-Drive 360 Orlando Eye experience is packaged with four other attractions run by Merlin Entertainments including a SeaLife Aquarium and a Madame Tussauds. The SeaLife Aquarium of the I-Drive 360 experience will be Merlin Entertainments’ 50th SeaLife Aquarium. It will exhibit classic SeaLife themes as well as information about local Florida habitats and the Everglades. With over 20 million guests per year visiting SeaLife aquariums, this addition to the I-Drive 360 package is targeted to families, with children ages 8-12. Exhibits such as cold water Pacific NorthWest touch pools, a shipwreck play area, and interactive screens that display information about the selected animal are all part of providing a marine conservation learning for those who come. Additional programs include talks between divers and guests, behind the scene tours for food preparation, water quality, and feeding, as well as school group tours. Across the lobby also lies a Madame Tussauds, where guests can spend time with wax figures of celebrities. Each figure takes over 300 measurements to create a wax replica. “Dead figures are ironically the easiest,” laughs Marketing Executive, Heather Hagelberger. “You’d be surprised at how detailed old statistics can be.” Figures are chosen and created based on those who have made a significant impact in their field and can be touched all around by the public, figures ranging from international, domestic, and local celebrities such as Justin Bieber and One Direction to President Obama. After witnessing wax come to life through the countless figures and exhibits, guests can then create a wax mold of their own hand as a memento of their tour. Based in Mumbai, India, Ankam Corporations exhibited at the IAAPA Attractions Expo for the first time to make a splash in the waterslide industry with its ocean-themed concepts. Ankam Corporations launched four of its newest waterslide designs. What makes them special is not just that each is based on an individual sea creature, but that the “structure is not seen on the outside, it is all in the slide,” says Ganesh Ankam, Director. Ganesh Ankam comes from a background in Mechanical Engineering, having worked in Research & Development in the industry for 10 years prior to founding Ankam Corporations in 2012. 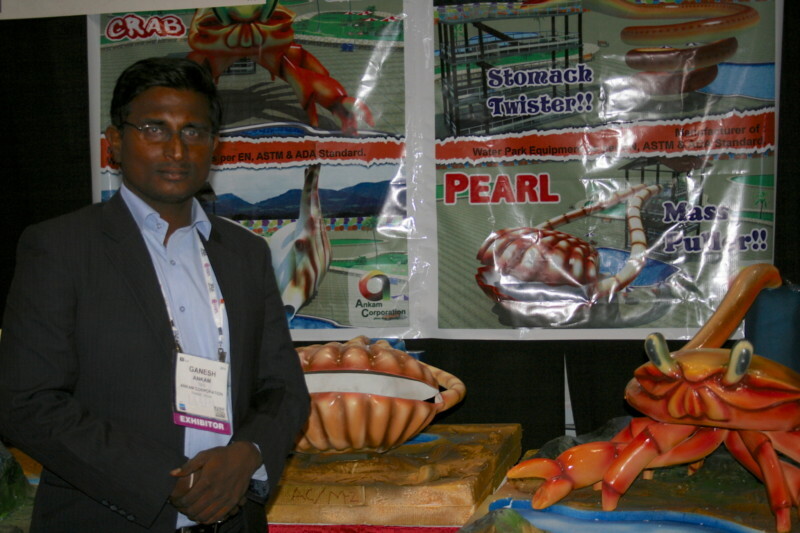 Ganesh Ankam from Ankam Corporation launches his innovative ocean-themed waterslides. Photo: Rebecca Lam. Each of these slides has its own personality and pushes past the standard of waiting in line amidst support structures, hiding them with a themed exterior. Naga, the Indian name for cobra, brings riders through the cobra’s mouth into a series of narrowing turns that are engineered for each turn having different center of gravity and thrill experience. Meanwhile, Crab is designed to bring out at least 3-4 moments of excitement in the dark before emptying out of one of Crab’s claws into the lagoon below. The two other launched rides include Shell and Pearl whisking riders through a conch and oyster shell. “My goal is to be known within two years as the most innovative company in my field,” states Ankam. His goal for next year’s show is to launch a brand new waterslide concept that allows riders to have control over their ride location and speed. A most exciting thrill feature was the S&S—Sansei Technologies 4-D Free Spin Coaster. With an average speed of 76 mph and 4Gs of G-Force, the 4-D Free Spin Coaster contains seats that rotate 360° on a winged chassis that dangles riders over open air in a head-over-heels journey. Allen and the rest of the S&S—Sansei team are “very much looking forward to the spring opening in Fiesta Texas of the first 4D Free Spin on planet Earth and the only one on planet Earth” and hope to install many more at other Six Flags parks. When I first met Steve Birket of Birket Engineering in Sarasota, Florida during the Themed Entertainment Association’s (TEA) 2014 SATE conference (Storytelling, Architecture, Technology, Experience), I was ecstatic – because it was thanks to Birket Engineering’s support that I was able to come on scholarship to SATE as a NextGen member and engineering student. 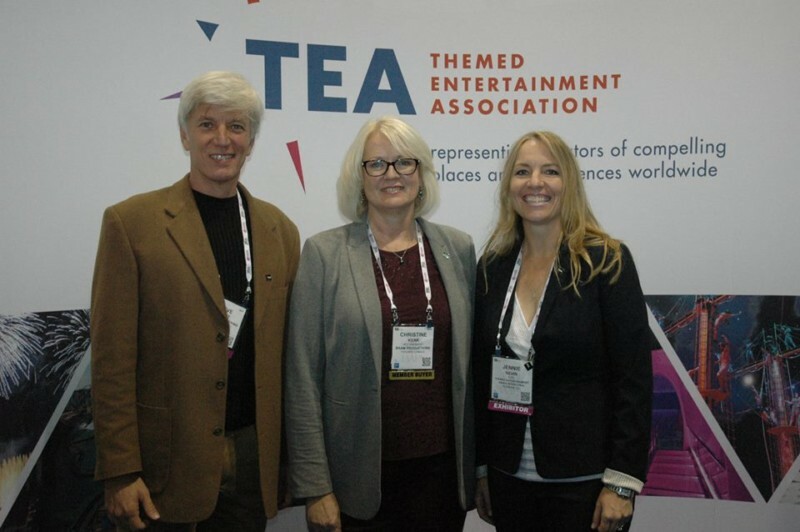 Birket and his company have displayed a genuine interest in helping to carve out opportunities for students and young professionals, and I was happy to have the chance to interview him during the IAAPA Attractions Expo, with a focus on his new position as president of TEA. Birket gives due credit to immediate past president Christine Kerr of BaAM Productions, who passed the gavel to Birket after two years in office. “My job is much easier because of what Christine has done. She has set everything up for success.” He cited formation of the TEA Asia-Pacific Division, the Association’s new website, and the first full year with COO Jennie Nevin at the helm of TEA headquarters in Burbank.